Microsoft will release an Xbox One S console without an included Blu-ray Disc drive as has been rumored since late last year. 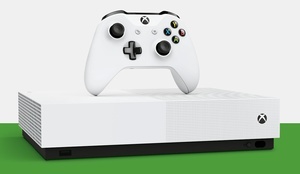 The new Xbox One S All-Digital Edition will be released on May 7 for $250, which is $50 less than a typical Xbox One S that has an optical disc drive. It comes with an Xbox Wireless controller, a 1TB hard drive and with three popular Microsoft-owned titles: Minecraft, Sea of Thieves and Forza Horizon 3. Rumors that Microsoft was working on an Xbox One without a disc drive started in late 2018. It is aimed at customers who download their games, or are subscribers to the Xbox Game Pass service. It also comes ahead of Microsoft's upcoming game streaming platform, dubbed Project xCloud. To coincide with the forthcoming release of the all-digital version of the Xbox One, Microsoft is also offering access to Xbox Game Pass and Xbox Live Gold for a $15 per month fee. That cost is actually the same as if you had subscribed to Game Pass, which is $10 per month, and had an annual Xbox Live subscription at $60 per year (and so, $5 per month), though of course the latter would have to be paid in full for a year rather than monthly.